Welcome to this week’s edition of The Friday Five! The Friday Five is a feature that I post every Friday in which I give my thoughts on a topic that’s related to NBA Live, NBA 2K, and other basketball video games, as well as the real NBA, and other areas of interest to our community. The feature is presented as either a list of five items, or in the form of a Top 5 countdown. This week’s Five is a list of five ways to improve MyCAREER in NBA 2K20. MyCAREER remains the most popular mode in NBA 2K, both for the ability to live the life of an NBA player, and participate in online multiplayer gaming through the connected experiences of 2K Pro-Am and The Playground. It has achieved popularity through being a deep and robust mode, and innovations such as detailed stories. While its implementation of VC has at times been controversial due to the way it encourages microtransactions, it’s contributed greatly to the recurrent revenue model despite some vocal grumbling from gamers. Overall, it’s been a huge success for NBA 2K. Nevertheless, both the offline and online aspects of MyCAREER still have room for improvement. 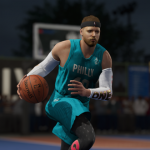 I’ve enjoyed the experiences they offer despite traditionally being a franchise gamer, and found myself getting drawn back into MyCAREER in NBA 2K19 despite feeling that this may be the year to take a break. Having played the mode extensively over the past few years, I have a few thoughts on how it could provide an even better experience for basketball gamers. From the handling of the story and goodwill, to game balance and better functionality, here are five ways that NBA 2K20 could make an already great mode even better. Welcome to this week’s edition of The Friday Five! The Friday Five is a feature that I post every Friday in which I give my thoughts on a topic that’s related to NBA Live, NBA 2K, and other basketball video games, as well as the real NBA, and other areas of interest to our community. The feature is presented as either a list of five items, or in the form of a Top 5 countdown. This week’s Five is a list of five ways to improve Franchise mode in NBA Live 20. Our Wishlists for NBA Live 20 and NBA 2K20 have been submitted, but as we await another preview season, I feel like talking about my hopes for the upcoming titles. I’m beginning with NBA Live 20, as it needs to be a big year for the long-running hoops series from EA Sports. NBA Live 18 and NBA Live 19 have been EA’s best efforts in quite some time, but there’s plenty of room for improvement. A recurring complaint that I’ve seen is that there isn’t enough focus on the NBA in NBA Live, and that’s a sentiment that I share. One way to address that is to give more attention to Franchise. The counterargument I’ve seen to that suggestion is that Franchise is old hat for old heads, and that no one cares about it. Considering the fact that us old heads do care about it, and that younger basketball gamers have also expressed their frustration with the lack of depth to Franchise, it’s ridiculous to suggest that no one cares, and that it’s unimportant. NBA Live must provide deep, engaging experiences across the board, and with The One and its connected modes already quite robust, it’s time that a few enhancements were made to Franchise. As a long-time franchise mode enthusiast, I believe that focusing on these five key aspects will help achieve that goal. Welcome to this week’s edition of The Friday Five! The Friday Five is a feature that I post every Friday in which I give my thoughts on a topic that’s related to NBA Live, NBA 2K, and other basketball video games, as well as the real NBA, and other areas of interest to our community. The feature is presented as either a list of five items, or in the form of a Top 5 countdown. This week’s Five is a list of five ways that retro teams could be improved and better utilised in future NBA 2K games. I know I’ve talked about retro teams a lot over the past few weeks in The Friday Five, but there are just so many intriguing possibilities. I’m taking a break from suggesting specific squads that I’d like to see added, and instead taking a look at how retro teams could be put to even better use in future iterations of NBA 2K. The current approach is certainly satisfactory for the most part, and in terms of providing extra content, it’s a long way ahead of what NBA Live is offering. Nevertheless, there are ways in which the retro teams could be handled better. Obviously, there are other priorities to consider when it comes to the quality of future NBA 2K titles. Refining player movement and physics is important. Achieving a good balance between online and offline play is an ongoing challenge. Addressing issues with the amount of grinding and fairness of recurrent revenue mechanics is something that absolutely needs to be sorted out. However, there is room to discuss ideas for the bonus content, and indeed, the prevalence of retro teams in NBA 2K has more or less established them as a key part of the experience, year in and year out. To that end, here are five ways to improve NBA 2K’s retro teams! Welcome to this week’s edition of The Friday Five! The Friday Five is a feature that I post every Friday in which I give my thoughts on a topic that’s related to NBA Live, NBA 2K, and other basketball video games, as well as the real NBA, and other areas of interest to our community. The feature is presented as either a list of five items, or in the form of a Top 5 countdown. This week’s Five is part eleven in a series of lists of retro teams that I’d like to see added to NBA 2K. It’s just about time for me to be moving on to some other topics with the Friday Five, as I’ve been covering retro teams I’d like to see in future NBA 2K games for a month now. However, I do have another five teams that I thought of while planning these features, so I figured I’d wrap things up for now and come back with new lists later on down the road. After all, this may be the last list for now, but I’m sure more teams will occur to me. As I’ve said, when you look beyond former champions, their opponents, and other noteworthy teams, you can come up with some fun and unorthodox ideas. There are certainly some teams in Part 11 that fit that description! With the current decade drawing to a close, I’ve also looked to include a couple more retro teams from the past ten years, as some of them are becoming nostalgic in their own right. If I can talk about NBA 2K17 in Wayback Wednesday, then I can surely include a few teams from the early 2010s on these lists! As with my previous features, I’m making these suggestions in addition to the teams I’ve already mentioned; I’d still like to see those teams in NBA 2K as well. I’m also assuming that enough of the necessary players will be licensed, if they’re not in the game already. With that said, let’s get to the list! Welcome to this week’s edition of The Friday Five! The Friday Five is a feature that I post every Friday in which I give my thoughts on a topic that’s related to NBA Live, NBA 2K, and other basketball video games, as well as the real NBA, and other areas of interest to our community. The feature is presented as either a list of five items, or in the form of a Top 5 countdown. This week’s Five is part ten in a series of lists of retro teams that I’d like to see added to NBA 2K. With this list of retro teams, I’ve reached a total of fifty throwback squads that I feel would make fun additions to NBA 2K! Although I’ve already covered many of the obvious choices in previous lists, thinking back through over seventy years of NBA history offers up a continuous stream of possibilities. As I’ve noted in my previous articles, some of the recently added retro teams open the door for squads beyond former champions, their opponents, and other great teams of note. Just because a team didn’t achieve great success in real life doesn’t mean that they aren’t fun to play with. To that end, here are five more retro teams that would be fun to have in NBA 2K by default! Once again, these squads don’t override my previous suggestions; they’re all teams that I’d be interested in seeing included in future games. These suggestions are also assuming that all of the key players (or at least most of them) can be licensed, if they’re not in the game already. After all, it would defeat the purpose of adding new retro teams if they can’t even field five real players, preferably their actual starting five (though NBA 2K does currently include retro teams that are missing one of their regular starters). With all that being said, let’s get to the list! Welcome to this week’s edition of The Friday Five! The Friday Five is a feature that I post every Friday in which I give my thoughts on a topic that’s related to NBA Live, NBA 2K, and other basketball video games, as well as the real NBA, and other areas of interest to our community. The feature is presented as either a list of five items, or in the form of a Top 5 countdown. This week’s Five is part nine in a series of lists of retro teams that I’d like to see added to NBA 2K. While I was mulling over ideas for Part 8 of this series on retro teams I’d like to see in future NBA 2K games, I ended up with enough squads for Parts 9, 10, and 11 as well. Originally, I intended to space those articles out over the next few months so as not to run the topic into the ground, but since we’re on the heels of submitting our Wishlists for NBA 2K20 and NBA Live 20, I’m still in the mood to talk about content that I’d like to see. Besides, I had fun capturing the necessary screenshots and I’m eager to put them to use, so for this week at least, I’m going back to back with Part 9. As with the previous lists, I’m exploring some unorthodox ideas for retro teams, as the squads that have been added in recent years go beyond the obvious choices of former champions, their opponents, and other teams with notable success. Once again, I must also emphasise that the latest list of suggestions doesn’t override or cancel out any of my previous suggestions; they’re just more teams that I’d like to see included in future games. As always, these suggestions are being made under the assumption that all of the necessary players, or at least an ample amount of them, will be licensed. Without any further ado, here are five more retro teams to consider! Episode #276 of the NLSC Podcast is out now! Join Arcane and myself as we discuss the latest patch for NBA Live 19, reports that the WNBA will be featured in NBA 2K20, and the 2019 All-Star Weekend in Charlotte. Patch 1.21 has come through for NBA Live 19. In addition to ending the Double XP event, it includes updated All-Star warm-ups, new gear, and fixes for a couple of other issues. Our Wishlists for NBA Live 20 and NBA 2K20 have been submitted, and gratefully received by our contacts at EA Sports and Visual Concepts. Thanks to everyone who contributed! It’s looking like the WNBA will be featured in NBA 2K20. We speculate on what kind of presence it will have, and whether it will end up being a missed opportunity for NBA Live in terms of fleshing out its WNBA content. We dedicate the rest of Episode #276 of the NLSC Podcast to our thoughts on all the highs and lows from the 2019 All-Star Weekend. We try our best not to sound like cranky old men, with varying degrees of success. Our official NLSC Wishlists for NBA Live 20 and NBA 2K20 have been finalised and submitted to the developers at EA Sports and Visual Concepts respectively! A big thank you to everyone who helped us compile constructive feedback for the upcoming games. As always, there’s no guarantee that our wishes will be granted, but if we don’t speak up, we can guarantee that they’ll go unheard. Although we won’t be making any further additions to our Wishlists, the topics will remain open until the preview season for NBA Live 20 and NBA 2K20 gets underway. Discussion about what we want to see in the new games is obviously still most welcome, and we can try to pass along any late suggestions as well. You can check out the NBA Live 20 Wishlist here, and the NBA 2K20 Wishlist here. They’re also available in PDF format, here and here respectively. We’ve tried our best to present an accurate and comprehensive cross-section of what our community wants out of both games, and hopefully, we’ll see some of our most desired additions, fixes, and changes implemented sooner rather than later. In the meantime, feel free to keep the conversation going! Episode #273 of the NLSC Podcast is out now! Arcane returns to the booth this week as we catch up on the latest title updates for NBA Live 19 and NBA 2K19, spotlight some recent mod releases, discuss the 2019 NBA All-Star selections, and react to the Kristaps Porzingas trade. The latest patch for NBA Live 19 has added several new courts to 3v3 LIVE Run. While we’re still hoping to see more attention paid to other modes in the future, they’re definitely worthwhile additions. On top of that, a very worthy member of the community has been featured in a LIVE Event. NBA 2K19 also received a new patch this week. It contains some promising gameplay tweaks, and some welcome bug fixes. We’ll have further impressions in the near future. We provide a quick round-up of some recent mod releases, including a 1992 Season Mod for NBA 2K19 PC, a College Hoops 2K mod for NBA 2K11, and the latest versions of U R Basketball for NBA 2K13 and NBA 2K14. Moving on to some NBA discussion, the 2019 All-Stars have been revealed. We give our thoughts on this year’s selections, as well as the special additions of Dwyane Wade and Dirk Nowitzki. We wrap up Episode #273 of the NLSC Podcast with our thoughts on Kristaps Porzingas being traded to the Mavericks, which certainly caught a lot of fans off-guard (ourselves included). We also speculate on the likelihood that Anthony Davis will be moved by the deadline. We’re at midcourt, and the ball is about to go up…it’s Monday Tip-Off! Start your week here at the NLSC with a feature that’s dedicated to opinions, commentary, and other fun stuff related to NBA Live, NBA 2K, and other basketball video games. This week, I’m tipping things off with my thoughts on how NBA Live needs to establish its identity, and deliver an experience with greater longevity. There seems to be somewhat of a divide and a notable amount of unrest among NBA Live gamers at the moment. At a time when we should be consolidating out feedback – obligatory cheap plug for our NBA Live 20 Wishlist – there’s a lot of argument about the future of the series. Many gamers are expressing concerns and frustration, while others are arguing that we must all be supportive and, to borrow a slogan, trust the process. Both sides have a point and are coming from a good place, though I do find myself agreeing more with the former group. That’s probably because the group that’s most frustrated tend to be gamers my age. We remember a time when NBA Live was the dominant brand in 5v5 sim-oriented NBA games, and all the things that made it successful. Needless to say, that’s led to a bit of sneering at us allegedly out of touch “old heads”; a term that’s quickly come to highlight the toxicity in today’s basketball gaming community. At the same time, it is certainly easy to get caught up in the past, and we do need to have some patience, but it’s getting tougher for a lot of NBA Live loyalists to remain patient. Ultimately, NBA Live needs to forge an appealing identity that results in longevity and a deeper game.